I’ve really struggled with what to write about the triple homicide that occurred last week. I knew that I wanted to write something about it, but it seems silly to just write the cold facts or to pull all the news articles together in a list. The other night at church it became a little more clear. David’s message was about peace, reconciliation, and community from Ephesians 2:11-22. The middle of the passage verses 14-18 really fit well with the week’s events. For he [Jesus] himself is our peace, who has made the two one and has destroyed the barrier, the dividing wall of hostility, by abolishing in his flesh the law with its commandments and regulations. His purpose was to create in himself one new man out of the two, thus making peace, and in this one body to reconcile both of them to God through the cross, by which he put to death their hostility. He came and preached peace to you who were far away and peace to those who were near. For through him we both have access to the Father by one Spirit. On Wednesday night one or two men entered Seward Market & Halal Meats (a Somali owned business approximately 2 miles from our house and a few blocks from our church) with the intention of killing at least the man behind the counter. Unfortunately, his cousin had stopped by to chat and bring him tea. Before it was over 3 men had been shot and killed in the peaceful store. The Somali employee (owner? ), his cousin, and an Oromo shopper were all killed for no clear reason. 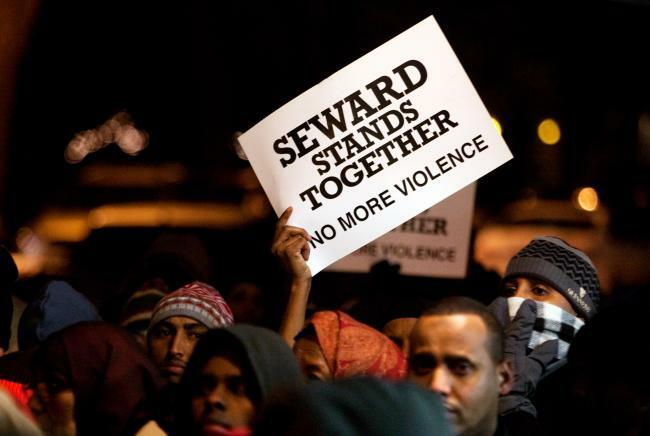 Seward is a fairly peaceful community with about every possible type of diversity. A large East African population melded with a Scandinavian population with everyone else thrown together. Much has been done to keep the neighborhood safe and prosperous. By all accounts the Seward Market was a stable small business with an engaged owner and peaceful employees. On Thursday night a candlelight vigil was held on the corner of the street and many (some estimate up to 300) people stopped by, standing against violence. This was by far one of the largest gatherings I’ve attended or even heard about where Somali community members and non-Somali neighbors gathered and mingled together. It was a time to honor the dead, build peace, and community. The investigation continues and a memorial fund has been setup for the victims families (details). Murder is never good. It is what we do with the murder than can change lives and hopefully prevent future murders. In the past year or so, there has been an increase in violence within the Somali community and while no one has officially said so, it is rumored to be almost all along traditional clan lines. Most people will say that many of those clan barriers have been broken down, but it isn’t always lived out in day to day life. Mosques and Somali markets are still segregated along clan lines and there are credible rumors that this recent murder occurred at least in part as a reaction to violence that recently occurred in Somalia. There is nothing more beautiful than seeing a diverse community come together to celebrate Peace, Shalom, Nabad, or Selam. It was goose-bumpy feeling to have people chanting for peace, in their own languages and then together in Somali, while standing at the scene of a crime. But true peace is hard. For peace to occur there has to be a surrender of some sort and that is never easy. We are called to by peace makers and lovers of our neighbors. Without justice, there can be no peace. He who passively accepts evil is as much involved in it as he who helps to perpetrate it. One way to fight for peace is to fight for justice. We need to fight to make sure that our East African neighbors feel at home in our neighborhoods. We need to help them learn English, we need to build bridges so we can understand their culture and they ours. We need to provide opportunities for their children to recieve a high quality education. We need to make sure their children have safe places to play and learn. We need to help them find gainful employment. We need to support their small businesses. We need to humble our arrogant selves. We need to befriend all of our neighbors. This will bring about justice and peace. By now, the Twin Cities should realize that we won’t have peace on our streets until there is peace in Somalia (and other places where our refugees come from). It is becoming increasingly clearer that to some degree that even though Somalia and the Twin Cities are thousands of miles apart, they are tightly connected. For peace and justice on our streets there needs to be peace and justice on the streets of Mogadishu, Hargase, and all of Somalia. This Star-Tribune article features an interview with a man from our church. MPR does a great job of reporting, including some subtle mentions of issues in Somalia. Update: Since I first started writing this on Saturday, two 17 year old boys have been arrested in connection to the murder. While this is good news, so that justice may prevail. Their ages add another layer of tragedy to the situation. I hope that their motives will be expressed and made clear so that this doesn’t have to happen anymore. Adventures and Thoughts of Team Cross is powered by	WordPress 4.3.19 and delivered to you in 0.314 seconds using 36 queries.